WASHINGTON -- WASHINGTON (AP) — Space is vast, but it may not be so lonely after all: A study finds the Milky Way is teeming with billions of planets that are about the size of Earth, orbit stars just like our sun, and exist in the Goldilocks zone — not too hot and not too cold for life. 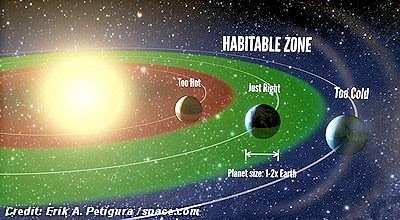 Astronomers using NASA data have calculated for the first time that in our galaxy alone, there are at least 8.8 billion stars with Earth-size planets in the habitable temperature zone. The study was published Monday in the journal Proceedings of the National Academy of Science. For perspective, that's more Earth-like planets than there are people on Earth. As for what it says about the odds that there is life somewhere out there, it means "just in our Milky Way galaxy alone, that's 8.8 billion throws of the biological dice," said study co-author Geoff Marcy, a longtime planet hunter from the University of California at Berkeley. "Earth-like Planets More Widespread in Universe than Previously Believed"